1. What kind of orbits do comets have? 2. Describe the tail of a comet. Click here for an interactive demonstration of comet tails. 3. Name two categories of comets. Orbits highly inclined to the ecliptic. Originate vast distances from the sun. 4. What is the Kuiper Belt? Where short period comets originate. Disc shaped region of icy bodies. 5. What is the Ort Cloud? Where long period comets originate. Spherical region of Cometary nuclei. Roughly 50,000 AU from sun. 6. What is the difference between a meteoroid and a meteorite? A meteoroid is a small rocky irregular lump in the solar system. When a meteoroid enters the earth’s atmosphere it turns into a meteor. If it survives and impacts the ground it is termed a meteorite. 7. Name three origins of meteoroids. Broken fragments of colliding asteroids. Impacts with the surface of the moon or Mars. 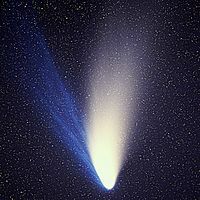 The dust tails of comets. 8. How fast can a meteoroid’s orbit be? 9. What is a Meteoroid shower? They can be a dramatic increase in the number of meteors observed when the earth passes through a meteoroid stream left by a comet. This is a meteor shower. 10. What causes meteors to appear as light streaks in the sky? When a Meteoroid enters the earth’s atmosphere it becomes a meteor. Friction between a meteor and the surrounding air produce heat and light and can be seen as light streaks in the night sky. 11. What is a fireball? Meteors with a bright magnitude of -3 or less. 12. What is the radiant? A point in the night sky from which meteors appear to diverge from. 13. Describe the classification of meteorites. 14. How do we name meteor showers? Named after the constellation in which the radiant is found. 15. Name 4 annual meteor showers and when they occur. 16. What is the definition of an NEO? 17. What is a PHO? An object that has an orbit that brings them closer to earth than 0.05AU. 18. Give examples of collisions between astronomical bodies in the solar system. Believed to have caused extinction of dinosaurs. Astronomers around the world witnessed this. 19. Why do we need to monitor PHO’s? Because if one hits us that is powerful enough, it could have catastrophic consequences for life on Earth especially if the PHO’s are larger than 1km. 20. 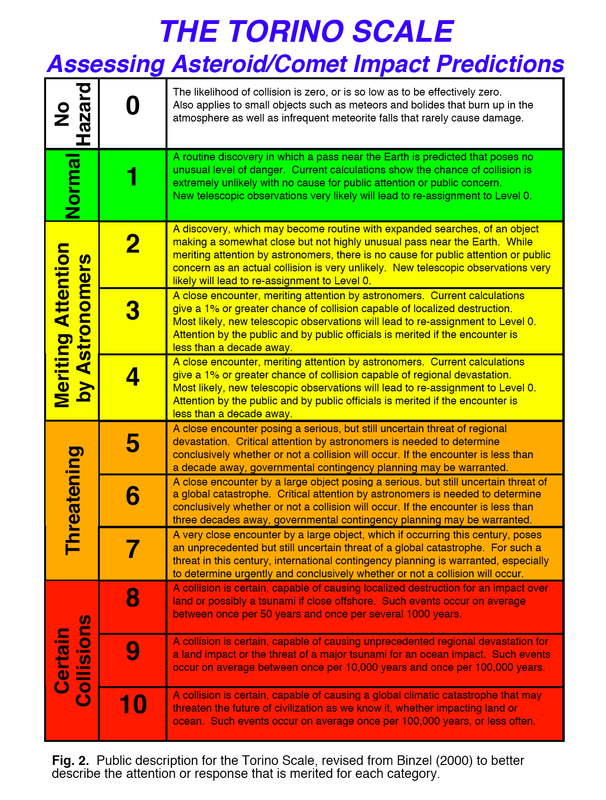 What is the Torino Scale? 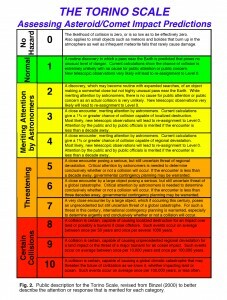 8,9,10 infer certain collision causing local or worldwide devastation.